Leupold has been making some of the finest scopes in the industry for over 60 years. 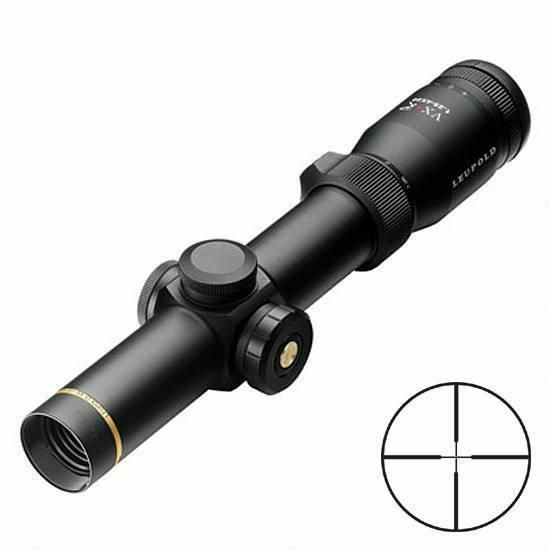 The original Leupold scope, created by Marcus Leupold, was created like many hunting accessories: lack of quality commercially available gear. He set out to create a better scope and has since set the standard that others are held to. When your shots have to count use a Leupold! Sleek design with daylight-capable illumination, the Leupold VX-R patented 1 button design minimizes bulk, while allowing users to select between 8 intensity settings, including a low/high indicator. The readily available CR-2023 coin-cell battery produces remarkable run times, while the fiber optic light pipe eliminates the need for an eyepiece-based control module. Proprietary motion sensor automatically deactivates illumination after 5 minutes of inactivity, yet reactivates instantly as soon as any movement is detected. Leupold's legendary Index Matched Lens System combines with edge-blackened lead free lenses for astonishing clarity and light transmission, while the extreme fast-focus eyepiece ensures optimal diopter adjustment in the field. The 30mm main tube and finger-click adjustments assure maximum adjustment precision, while the second generation waterproofing resists the effects of thermal shock much more efficiently than standard nitrogen. Water proof, shockproof, and backed by the Leupold Full Lifetime Guarantee, the Leupold VX-R is the next generation in sporting optics.